The right digital strategy needs to be specific to your organization, but a good one will always have these three traits. Three years of research consistently highlights the single biggest predictor of a company’s digital maturity as the existence of a clear and coherent digital strategy. In 2015, MIT Sloan Management Review’s collaborative research with Deloitte found that more than 80% of respondents who rated their companies as digitally maturing said that their organizations had a clear and coherent digital strategy, a sentiment felt by less than 20% of respondents from less digitally mature companies. 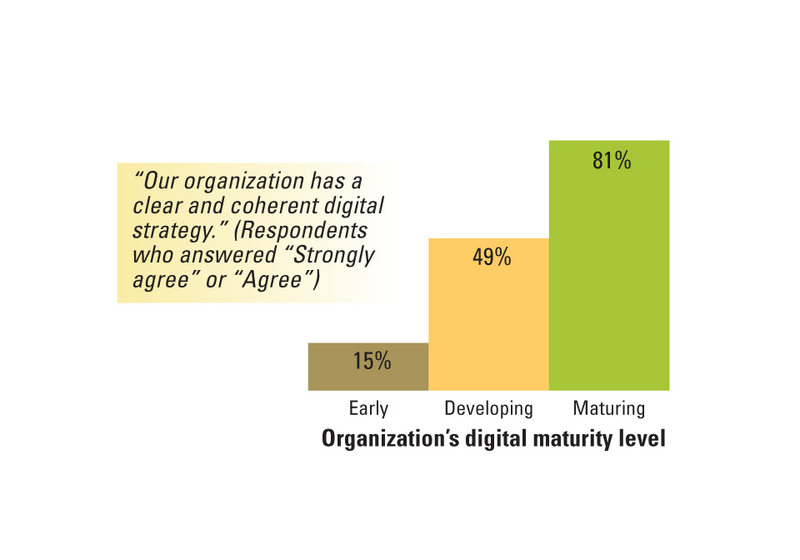 Having a clear and coherent digital strategy is the biggest indicator of an organization’s digital maturity. Source: G.C. Kane, D. Palmer, A.N. Phillips, D. Kiron and N. Buckley, “Aligning the Organization for Its Digital Future,” MIT Sloan Management Review and Deloitte University Press, July 2016. Given the central importance of strategy to digital maturity, you may be surprised to learn that this article is not going to help you or your company develop a digital strategy. Developing an effective digital strategy is something that must be tailored to the organization and involves a careful assessment of the competitive environment, your organization’s capabilities and resources, the state of relevant technology, and a host of other possible variables. Entire books have been written on particular types of digital strategies, and many of these are quite good. 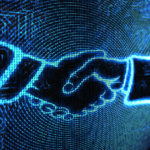 For example, George Westerman, Didier Bonnet, and Andrew McAfee offer a nice treatment of how large companies are using digital to gain strategic advantage. David Rogers of Columbia University penned a volume on how leaders should update their thinking for a digital age. Marshall Van Alstyne and his colleagues wrote a book just for strategies for platform businesses. I can even recommend my colleague John Gallaugher’s textbook as perhaps the most consistently up-to-date discussion of digital strategy out there — he updates the material yearly. Given the diversity represented in these texts alone, there are likely many different digital strategies that may be effective in a given setting. Digital tools can be used in many different “right” — and surprising — ways to add value to an organization. Despite the many differences between the nature of digital strategy at digitally maturing companies, our research demonstrates that these strategies still share a number of common characteristics. Understanding these shared characteristics can help ensure that your company’s digital strategy — whatever it may be — is on the right track. Digitally maturing companies tend to think on a longer time horizon when developing their strategy. Maturing companies are roughly twice as likely as early and developing companies to look five or more years out when completing this exercise. Although the past decade has seen widespread digital disruption with the rise of social media, mobile platforms, and analytics, new digital disruptions are coming over the next decade that will be at least as disruptive — such as virtual reality, artificial intelligence, and increased automation. Developing a digital strategy is not a “one-and-done” effort; it continues to evolve in step with technological innovations. Yet even a time horizon of five years may not be long enough. Deloitte’s John Hagel lamented that most companies don’t look far enough ahead when thinking about digital strategy. Instead of the one- to three-year time frame that most companies use for digital strategy, Hagel advocates using a 10- to 20-year time frame — at least at times. In our own research, we found that the vast majority of companies are not thinking on this long time frame. Yet more and more leaders are recognizing that such a long view is necessary. For example, Walmart Stores Inc. recognized that it needed to start its digital transformation now, because what customers will want 10 years from now will be radically different than what they want today. Second, while our research clearly demonstrates that top management support is indispensable when executing digital strategy, so is getting buy-in from lower-level managers and frontline employees. These managers can serve as effective sensors for unintended barriers to or implications of your digital strategy. For example, when Volvo Car Corp. began innovating with connected cars, it led a number of other changes to its management, contracting, and partnering to support the type of innovation the company was cultivating. Cross-functional connections and knowledge sharing were key. Without strong communication across all levels of the organization, top managers may not be aware when changes are necessary to help the digital strategy reach its goals. Non-executive leaders can also serve as valuable first responders, helping to tackle problems that may occur with respect to executing your digital strategy. Thus, once this strategy has been effectively communicated to them, they should be given some latitude to act when they identify issues. One of the working hypotheses for our 2018 research is that more digitally mature companies push decision-making further down into the organizational hierarchy to enable the organization to respond faster to digital trends. Lastly, digital strategy in the most advanced companies typically involves their core business. In contrast, respondents from less digitally mature companies indicate either that their organization talks more about digital business than acts on it or that it thinks of digital business strategy as a collection of one-off initiatives that does little to affect the core business. Digital is core to business strategy in digitally mature companies. Source: G.C. Kane, D. Palmer, A.N. Phillips, D. Kiron, and N. Buckley, “Achieving Digital Maturity,” MIT Sloan Management Review and Deloitte University Press, July 2017. This response continues a theme that we’ve seen manifest in our research across the years of the study: Digital strategy isn’t just thinking of new initiatives that enable organizations to do business in the same way but slightly more efficiently. Instead, it involves fundamentally rethinking how one does business in light of all of the digital trends occurring both inside and outside the organization. It involves identifying potential new services, sources of revenue, and ways of interacting with employees. Yet effective digital strategy also involves treating these new possibilities as both an opportunity for your company and a threat. This technological infrastructure is also available to your established competitors or new startups, who may beat you to the punch for offering these new services or revenue streams and hurt your ability to compete. Keeping digital strategy as a core component of your overall strategy includes continuous observation of the competitive landscape, as well as ongoing experimentation to determine how your organization can leverage the strategic opportunities provided by ever-evolving technologies. A featured excerpt from The Mathematical Corporation by Josh Sullivan and Angela Zutavern. Emotion-sensing technologies can lead to better decisions and alleviate stress — if privacy issues are addressed. Leaders must develop new skills to effectively guide their organizations into the uncertain future of the digital age. The 4 most important lines for all digital leaders and laggards. As an agency owner, I found this article to be both daunting and true. Developing digital strategies is not “set it and forget it” and requires ongoing work. Smart evaluation of client channel potential is critical. It would be foolhardy and likely impossible to test every new innovation for every client. But as Mr. Kane suggests, we really do need to develop strategies looking years down the road for how a company’s business will be impacted and how they must be ready to serve their customer needs by anticipating them years in advance.